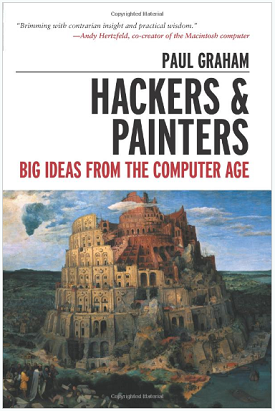 I enjoyed Hackers and Painters, if you are interested in startups, hackers or programming, it is worth a read. I first really learned about Paul Graham while reading The Launch Pad. He is the well know founder of Viaweb (now Yahoo Store) and Y Combinator, he’s also an exceptional essayist. I find his writings very convincing, well-structured and insightful. Hacker and Painters (2008) is a collection of his essays published on his personal site. The essays address topics ranging from the unpopularity of nerds, the similarities between hacking and painting as well as why and how startups create wealth. Although I struggled with some of the chapters later in Hackers and Painters, which was focused on programming languages, I really enjoyed this it. His resounding argument leaves no doubt that a small team of good, trusted programmers can outperform big companies. It is also clear that this combined with the increased productivity, free from any bureaucracy, creates new wealth. This newly created wealth that is obtained by hard work, sacrifice, and persistence is something society should encourage. In fact, he offers an alternative view on the much discussed gap between rich and poor. Unlike most economists that would argue that the widening gap between rich and poor is bad for any society, Graham sees it as a sign that innovation, which creates new wealth, is encouraged. This innovation and newly created wealth leaves the whole society better off. He argues that it is absolute poverty not relative poverty that you want avoid. Most of the last half of Hackers and Painters, Grahams discusses programming languages. By using his own startup (Viaweb) as an example he shows that picking the best fit in a programming language can give a startup a competitive advantage. That is something that I would have never considered. He also goes on to describe what he considers to be the dream language. Although I have already decided that I would like to learn to code. Hackers and Painters have forced me to ask a new question: Do I want to be a hacker? This entry was posted in Book Reviews, Reviews on 2013/01/16 by Justinus.